Problems quickly arise when the same schedule component enters a secondary, partial-width state. Top-level viewport break-points are no longer relevant, and styling the component becomes extremely difficult. In this simple example, the container’s size is determined by the size of its contents, because it’s floating. By default, its only child is 500px wide. However, whenever the container is greater than 450px wide, the child is 400px wide. In other words, if the child is 500px wide (thus making the container also 500px wide), then the child becomes 400px wide. But if the child is 400px wide (thus making the container also 400px wide), the child becomes 500px wide. Circular dependency! Each of the posts I’ve linked to above adds to the chorus of developer need, and all are to be commended for highlighting the issues developers face. While there have been many attempts at creating something that resembles Element Queries, most rely on polling, observers, hacky resize listeners, hand-rolled measurement routines, and an assortment of odds and ends that simply fail to produce the same level of API fidelity and reliability that native Media Queries do. So what does this mean? Is all hope lost? After doing a ton of research and experimentation, I believe I have a better solution to Element Queries – in fact, it may be the best solution possible while we wait for some sort of native implementation of the feature. The mechanism I’ve derived not only avoids the issues highlighted above, it also provides the full Media Query API, scoped to individual elements. 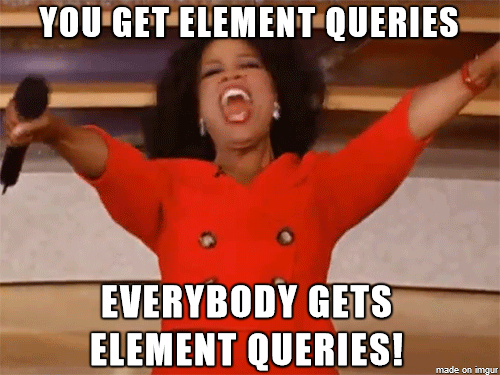 There are many factors to consider, but with a bit of out-side-the-box (literally) thinking, we’re giving Element Queries to everyone! Let’s talk about all the pieces we’ll need. I’ll start with the most basic ingredient: finding a way to associate a separate, scoped viewport with each of the elements we want to imbue with Element Query powers. What are the options? There are basically two routes: you can either try arcane event juggling with resize listeners or DOM polling, or utilize something that creates its own browsing context. Tab Atkins highlights one classic element that does this: the iframe. Sure, I guess we could toss content into an iframe, but they are heavy elements (in terms of performance), and placing all your content into a separate browsing context brings with it its own lame set of hassles, like style/script boundaries, lack of auto-height content flexibility, and a host of others. 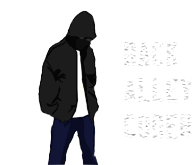 But hey, let’s not give up yet, there are other candidates for the staring role in this Element Query thriller: embed and object. The Conclusion: We’re going with option 2, the object element, for compatibility and (relative) ease in scripting its contents. Basically, I wouldn’t use 1000 object elements in your app – but as the test above shows, I wouldn’t go putting a 1000 img elements into the DOM either. Use this Element Query code in a smart and deliberate way. Instead of putting an element query on 1000 li elements, put one on the ul – this is my official appeal to common sense, folks. Now you may be thinking “So put content in an object element? Wow, great advice Dan, that’s really original. Yawn.”, but here’s the trick: we’re not putting any content inside the object element! A few posts back I did a walk-through of how you can create a resize event sensor out of a few divs and well-placed scroll events – this is along those lines. I’ve created two distribution flavors for this mechanism: 1) a vanilla module that enables use without reliance on any additional dependencies, and 2) an easy-to-use Web Component created with the awesome X-Tag library. Both versions of the Element Query code work in any browser that supports CSS Transitions. This is a generous compatibility range that covers all “app-ready” browsers. Let me know if you encounter any issues using the GitHub issue areas under each of the repositories listed at the end of the article. So what’s that object element doing in there? How’s that going to help with anything? The media="" attribute on the section element is how you declare your Element Query rules. There are two arguments for the media attribute’s query() function syntax. The first is an identifying query name that will be added to the matched-media="" attribute when its corresponding CSSMediaRule is matched within the object sensor. As the user, all you need to worry about is adding queries to the media attribute, and styling based on the matched-media attribute, all the rest happens automatically. If you set the innerHTML of an element, and that HTML contains an element that has the media="" attribute, it will not be element-quererized. This is something that is automatic when you use the Web Component version below. To augment the element with the query sensor, you’ll need to call the window method attachQuerySensor(ELEMENT_REF), passing the element as the first argument. You must take care not to inadvertently remove the object element from the element-quererized parent. If you do this, it will no longer be able to sense changes and determine query matches. The most common ways this can occur are using innerHTML to blow-out content, or a DOM library method to empty an element. One strategy to avoid this, is always using a single child element inside the target element and using that for content CRUDing. // the 'small-width' query is active, do some smally-widthy stuff! Checkout the demo, and go grab the code. Feel free to contribute to either of the repositories using their respective GitHub Issues area. Happy queryin’ folks! I’m writing my master’s thesis about element queries, and I’m using your element resize detection solution for my laborations. I noticed that you have switched from listening to object.onresize to the transition events instead. May I ask why?